Violet phosphorus is a form of phosphorus that can be produced by day-long annealing of red phosphorus above 550 °C. In 1865, Hittorf discovered that when phosphorus was recrystallised from molten lead, a red/purple form is obtained. Therefore, this form is sometimes known as "Hittorf's phosphorus" (or violet or α-metallic phosphorus). When first isolated, it was observed that the green glow emanating from white phosphorus would persist for a time in a stoppered jar, but then cease. 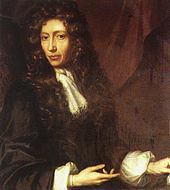 Robert Boyle in the 1680s ascribed it to "debilitation" of the air. Actually, it is oxygen being consumed. By the 18th century, it was known that in pure oxygen, phosphorus does not glow at all; there is only a range of partial pressures at which it does. Heat can be applied to drive the reaction at higher pressures. Phosphorus has a concentration in the Earth's crust of about one gram per kilogram (compare copper at about 0.06 grams). It is not found free in nature, but is widely distributed in many minerals, usually as phosphates. 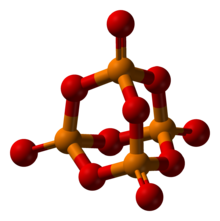 Inorganic phosphate rock, which is partially made of apatite (a group of minerals being, generally, pentacalcium triorthophosphate fluoride (hydroxide)), is today the chief commercial source of this element. According to the US Geological Survey (USGS), about 50 percent of the global phosphorus reserves are in the Arab nations. Large deposits of apatite are located in China, Russia, Morocco, Florida, Idaho, Tennessee, Utah, and elsewhere. Albright and Wilson in the UK and their Niagara Falls plant, for instance, were using phosphate rock in the 1890s and 1900s from Tennessee, Florida, and the Îles du Connétable (guano island sources of phosphate); by 1950, they were using phosphate rock mainly from Tennessee and North Africa. Phosphorous oxoacids are extensive, often commercially important, and sometimes structurally complicated. They all have acidic protons bound to oxygen atoms, some have nonacidic protons that are bonded directly to phosphorus and some contain phosphorus - phosphorus bonds. Although many oxoacids of phosphorus are formed, only nine are commercially important, and three of them, hypophosphorous acid, phosphorous acid, and phosphoric acid, are particularly important. The discovery of phosphorus, the first element to be discovered that was not known since ancient times, is credited to the German alchemist Hennig Brand in 1669, although other chemists might have discovered phosphorus around the same time. Brand experimented with urine, which contains considerable quantities of dissolved phosphates from normal metabolism. Working in Hamburg, Brand attempted to create the fabled philosopher's stone through the distillation of some salts by evaporating urine, and in the process produced a white material that glowed in the dark and burned brilliantly. It was named phosphorus mirabilis ("miraculous bearer of light"). Phosphorus was the 13th element to be discovered. For this reason, and due to its use in explosives, poisons and nerve agents, it is sometimes referred to as "the Devil's element". Phosphate rock, which usually contains calcium phosphate, was first used in 1850 to make phosphorus, and following the introduction of the electric arc furnace by James Burgess Readman in 1888 (patented 1889), elemental phosphorus production switched from the bone-ash heating, to electric arc production from phosphate rock. 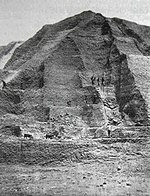 After the depletion of world guano sources about the same time, mineral phosphates became the major source of phosphate fertiliser production. Phosphate rock production greatly increased after World War II, and remains the primary global source of phosphorus and phosphorus chemicals today. See the article on peak phosphorus for more information on the history and present state of phosphate mining. Phosphate rock remains a feedstock in the fertiliser industry, where it is treated with sulfuric acid to produce various "superphosphate" fertiliser products. In the early 1990s, Albright and Wilson's purified wet phosphoric acid business was being adversely affected by phosphate rock sales by China and the entry of their long-standing Moroccan phosphate suppliers into the purified wet phosphoric acid business. The production of phosphorus may have peaked already (as per 2011), leading to the possibility of global shortages by 2040. In 2007, at the rate of consumption, the supply of phosphorus was estimated to run out in 345 years. However, some scientists now believe that a "peak phosphorus" will occur in 30 years and that "At current rates, reserves will be depleted in the next 50 to 100 years." Cofounder of Boston-based investment firm and environmental foundation Jeremy Grantham wrote in Nature in November 2012 that consumption of the element "must be drastically reduced in the next 20-40 years or we will begin to starve." According to N.N. Greenwood and A. Earnshaw, authors of the textbook, Chemistry of the Elements, however, phosphorus comprises about 0.1% by mass of the average rock, and consequently the Earth's supply is vast, although dilute. Side products from this process include ferrophosphorus, a crude form of Fe2P, resulting from iron impurities in the mineral precursors. The silicate slag is a useful construction material. The fluoride is sometimes recovered for use in water fluoridation. More problematic is a "mud" containing significant amounts of white phosphorus. Production of white phosphorus is conducted in large facilities in part because it is energy intensive. The white phosphorus is transported in molten form. Some major accidents have occurred during transportation; train derailments at Brownston, Nebraska and Miamisburg, Ohio led to large fires. The worst incident in recent times was an environmental contamination in 1968 when the sea was polluted from spillage and/or inadequately treated sewage from a white phosphorus plant at Placentia Bay, Newfoundland. In consequence, the 'strike-anywhere' matches were gradually replaced by 'safety matches', wherein the white phosphorus was replaced by phosphorus sesquisulfide (P4S3), sulfur, or antimony sulfide. Such matches are difficult to ignite on any surface other than a special strip. The strip contains red phosphorus that heats up upon striking, reacts with the oxygen-releasing compound in the head, and ignites the flammable material of the head. White phosphorus, called "WP" (slang term "Willie Peter") is used in military applications as incendiary bombs, for smoke-screening as smoke pots and smoke bombs, and in tracer ammunition. It is also a part of an obsolete M34 White Phosphorus US hand grenade. This multipurpose grenade was mostly used for signaling, smoke screens, and inflammation; it could also cause severe burns and had a psychological impact on the enemy. Military uses of white phosphorus are constrained by international law. 4 is required for all known forms of life. Phosphorus plays a major role in the structural framework of DNA and RNA. Living cells use phosphate to transport cellular energy with adenosine triphosphate (ATP), necessary for every cellular process that uses energy. ATP is also important for phosphorylation, a key regulatory event in cells. Phospholipids are the main structural components of all cellular membranes. Calcium phosphate salts assist in stiffening bones. Biochemists commonly use the abbreviation "Pi" to refer to inorganic phosphate. In medicine, phosphate deficiency syndrome may be caused by malnutrition, by failure to absorb phosphate, and by metabolic syndromes that draw phosphate from the blood (such as in refeeding syndrome after malnutrition) or pass too much of it into the urine. All are characterised by hypophosphatemia, which is a condition of low levels of soluble phosphate levels in the blood serum and inside the cells. Symptoms of hypophosphatemia include neurological dysfunction and disruption of muscle and blood cells due to lack of ATP. Too much phosphate can lead to diarrhoea and calcification (hardening) of organs and soft tissue, and can interfere with the body's ability to use iron, calcium, magnesium, and zinc. The white phosphorus allotrope presents a significant hazard because it ignites in air and produces phosphoric acid residue. Chronic white phosphorus poisoning leads to necrosis of the jaw called "phossy jaw". White phosphorus is toxic, causing severe liver damage on ingestion and may cause a condition known as "Smoking Stool Syndrome". In the past, external exposure to elemental phosphorus was treated by washing the affected area with 2% copper sulfate solution to form harmless compounds that are then washed away. According to the recent US Navy's Treatment of Chemical Agent Casualties and Conventional Military Chemical Injuries: FM8-285: Part 2 Conventional Military Chemical Injuries, "Cupric (copper(II)) sulfate has been used by U.S. personnel in the past and is still being used by some nations. However, copper sulfate is toxic and its use will be discontinued. Copper sulfate may produce kidney and cerebral toxicity as well as intravascular hemolysis." The manual suggests instead "a bicarbonate solution to neutralise phosphoric acid, which will then allow removal of visible white phosphorus. Particles often can be located by their emission of smoke when air strikes them, or by their phosphorescence in the dark. In dark surroundings, fragments are seen as luminescent spots. Promptly debride the burn if the patient's condition will permit removal of bits of WP (white phosphorus) that might be absorbed later and possibly produce systemic poisoning. DO NOT apply oily-based ointments until it is certain that all WP has been removed. Following complete removal of the particles, treat the lesions as thermal burns. "[note 1] As white phosphorus readily mixes with oils, any oily substances or ointments are not recommended until the area is thoroughly cleaned and all white phosphorus removed. ^ "Phosphorus: Chemical Element". Encyclopaedia Britannica. ^ a b A. Holleman; N. Wiberg (1985). "XV 2.1.3". Lehrbuch der Anorganischen Chemie (33rd ed.). de Gruyter. ISBN 3-11-012641-9. ^ Simon, Arndt; Borrmann, Horst; Horakh, Jörg (1997). "On the Polymorphism of White Phosphorus". Chemische Berichte. 130 (9): 1235. doi:10.1002/cber.19971300911. ^ Piro, N. A.; Figueroa, J. S.; McKellar, J. T.; Cummins, C. C. (2006). "Triple-Bond Reactivity of Diphosphorus Molecules". Science. 313 (5791): 1276–9. Bibcode:2006Sci...313.1276P. doi:10.1126/science.1129630. PMID 16946068. ^ A. Brown; S. Runquist (1965). "Refinement of the crystal structure of black phosphorus". Acta Crystallogr. 19 (4): 684. doi:10.1107/S0365110X65004140. ^ Cartz, L.; Srinivasa, S.R. ; Riedner, R.J.; Jorgensen, J.D. ; Worlton, T.G. (1979). "Effect of pressure on bonding in black phosphorus". Journal of Chemical Physics. 71 (4): 1718–1721. Bibcode:1979JChPh..71.1718C. doi:10.1063/1.438523. ^ Lange, Stefan; Schmidt, Peer & Nilges, Tom (2007). "Au3SnP7@Black Phosphorus: An Easy Access to Black Phosphorus". Inorg. Chem. 46 (10): 4028–35. doi:10.1021/ic062192q. PMID 17439206. ^ "Nobel Prize in Chemistry 1956 – Presentation Speech by Professor A. Ölander (committee member)". Retrieved 2009-05-05. 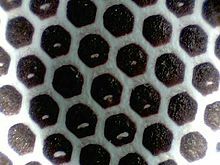 ^ "Phosphorus Topics page, at Lateral Science". Archived from the original on 2009-02-21. Retrieved 2009-05-05. ^ Vanzee, Richard J.; Khan, Ahsan U. (1976). "The phosphorescence of phosphorus". The Journal of Physical Chemistry. 80 (20): 2240. doi:10.1021/j100561a021. ^ "The Berkeley Laboratory Isotopes Project". Archived from the original on 2009-04-01. Retrieved 2009-05-05. ^ "Phosphorus-32" (PDF). University of Michigan Department of Occupational Safety & Environmental Health. Retrieved 2010-11-18. ^ Koo, B.-C.; Lee, Y.-H.; Moon, D.-S.; Yoon, S.-C.; Raymond, J. C. (2013). "Phosphorus in the Young Supernova Remnant Cassiopeia A". Science. 342 (6164): 1346. arXiv:1312.3807. Bibcode:2013Sci...342.1346K. doi:10.1126/science.1243823. PMID 24337291. ^ "Phosphate Rock: Statistics and Information". USGS. Retrieved 2009-06-06. ^ a b c d e Philpott, Tom (March–April 2013). "You Need Phosphorus to Live—and We're Running Out". Mother Jones. ^ D. E. C. Corbridge "Phosphorus: An Outline of its Chemistry, Biochemistry, and Technology" 5th Edition Elsevier: Amsterdam 1995. ISBN 0-444-89307-5. ^ Kutzelnigg, W. (1984). "Chemical Bonding in Higher Main Group Elements" (PDF). Angew. Chem. Int. Ed. Engl. 23 (4): 272–295. doi:10.1002/anie.198402721. ^ Mark, J. E.; Allcock, H. R.; West, R. "Inorganic Polymers" Prentice Hall, Englewood, NJ: 1992. ISBN 0-13-465881-7. ^ Heal, H. G. "The Inorganic Heterocyclic Chemistry of Sulfur, Nitrogen, and Phosphorus" Academic Press: London; 1980. ISBN 0-12-335680-6. ^ Weeks, Mary Elvira (1932). "The discovery of the elements. II. Elements known to the alchemists". Journal of Chemical Education. 9: 11. Bibcode:1932JChEd...9...11W. doi:10.1021/ed009p11. ^ Lewis R. Goldfrank; Neal Flomenbaum; Mary Ann Howland; Robert S. Hoffman; Neal A. Lewin; Lewis S. Nelson (2006). Goldfrank's toxicologic emergencies. McGraw-Hill Professional. pp. 1486–1489. ISBN 0-07-143763-0. ^ "Phosphate Rock" (PDF). USGS. Retrieved 2017-03-20. ^ Carpenter S.R. & Bennett E.M. (2011). "Reconsideration of the planetary boundary for phosphorus". Environmental Research Letters. 6 (1): 1–12. Bibcode:2011ERL.....6a4009C. doi:10.1088/1748-9326/6/1/014009. ^ Lewis, Leo (2008-06-23). "Scientists warn of lack of vital phosphorus as biofuels raise demand". The Times. ^ "Be persuasive. Be brave. Be arrested (if necessary)". Nature. Nov 12, 2012. ^ "ERCO and Long Harbour". Memorial University of Newfoundland and the C.R.B. Foundation. Retrieved 2009-06-06. ^ Charnovitz, Steve (1987). "The Influence of International Labour Standards on the World Trading Regime. A Historical Overview". International Labour Review. 126 (5): 565, 571. ^ "Obsolete hand grenades". GlobalSecurity.Org. Retrieved 2009-08-03. ^ Dockery, Kevin (1997). Special Warfare Special Weapons. Chicago: Emperor's Press. ISBN 1-883476-00-3. ^ Lipmann D. (1944) "Enzymatic Synthesis of Acetyl Phosphate" J Biol Chem. 155, 55-70. ^ Anderson, John J. B. (1996). "Calcium, Phosphorus and Human Bone Development". Journal of Nutrition. 126 (4 Suppl. ): 1153S–1158S. PMID 8642449. ^ Institute of Medicine (1997). "Phosphorus". Dietary Reference Intakes for Calcium, Phosphorus, Magnesium, Vitamin D, and Fluoride. Washington, DC: The National Academies Press. pp. 146–189. ^ "CBRNE – Incendiary Agents, White Phosphorus (Smoking Stool Syndrome)". Retrieved 2009-05-05. ^ "US Navy's Treatment of Chemical Agent Casualties and Conventional Military Chemical Injuries: FM8-285: Part 2 Conventional Military Chemical Injuries". Archived from the original on November 22, 2005. Retrieved 2009-05-05. ^ "CDC - NIOSH Pocket Guide to Chemical Hazards - Phosphorus (yellow)". www.cdc.gov. Retrieved 2015-11-21. ^ Skinner, H.F. (1990). "Methamphetamine synthesis via hydriodic acid/red phosphorus reduction of ephedrine". Forensic Science International. 48 (2): 123–134. doi:10.1016/0379-0738(90)90104-7. ^ a b "66 FR 52670—52675". 17 October 2001. Retrieved 2009-05-05. ^ "21 cfr 1309". Archived from the original on 2009-05-03. Retrieved 2009-05-05. ^ "21 USC, Chapter 13 (Controlled Substances Act)". Retrieved 2009-05-05. Parkes, G. D.; Mellor, J. W. (1939). Mellor's Modern Inorganic Chemistry. Longman's Green and Co.